For a replacement around £150 if you need to replace it. The starter motor works fine but the look is pretty bad and rusty. I wanted it to look better and also check it out while the engine was out of the car. I will assume that you have disconnected the battery in order to remove the wire to the starter motor. Once that is done there are two awkward volts that need to be undone in order to remove the starter from the bell housing, beware this is a heavy item and you done want this dropping on you. With the starter removed it’s so much easier to work on and to be honest there is not a lot to them. The silver hump on the back of the starter covers the solenoid and was originally silver. Now I must warn you that there is lots of metal windings inside this starter and you don’t want to contaminate it. I used a brass wire wheel attached to my drill and took the worst of the surface rust of. The metal band at the back of the starter and the solenoid cover are quite soft tin so be careful not to damage them. With the starter preliminarily cleaned up its time to remove the band at the back. This is a giant T-Bolt clip idea, a single slot head bolt and nut holds the band in place. Undo the volt and the band will release from the back to expose the inner workings. With the case cover removed this will now release the solenoid cover plate. Lift the cover gently from the main case to expose the gasket underneath. The cover is held at the front by a lip, pull the cover towards the back of the starter to free it up. You can now lift of the gasket to fully expose the solenoid contacts. Now the case is exposed you can check the inner workings and the contact brushes for any ware or damage. Yoc can press the top of the solenoid down to make sure the cog moves forward freely to engage the flywheel teeth. To stop contamination I used masking tape around the back of the windings and over the top of the solenoid. I masked of the complete front of the starter as this will be inside rhe bell housing and not seen, the aluminium part was left bare metal and coated with Gibbs Brand. This allowed for much closer cleaning and will now be pre-masked for spraying. I only cleaned up to the point where the covers were on the case as the rest would not be seen. But I did cot carefully with Gibbs Brand before I reassembled the starter. With all parts cleaned up on the case and degreased I gave a couple of coats of Red Oxide primer and allowed to cure. In the mean time I cleaned up the band and the cover with the soft brass wire wheel to take the grim and surface rust off. 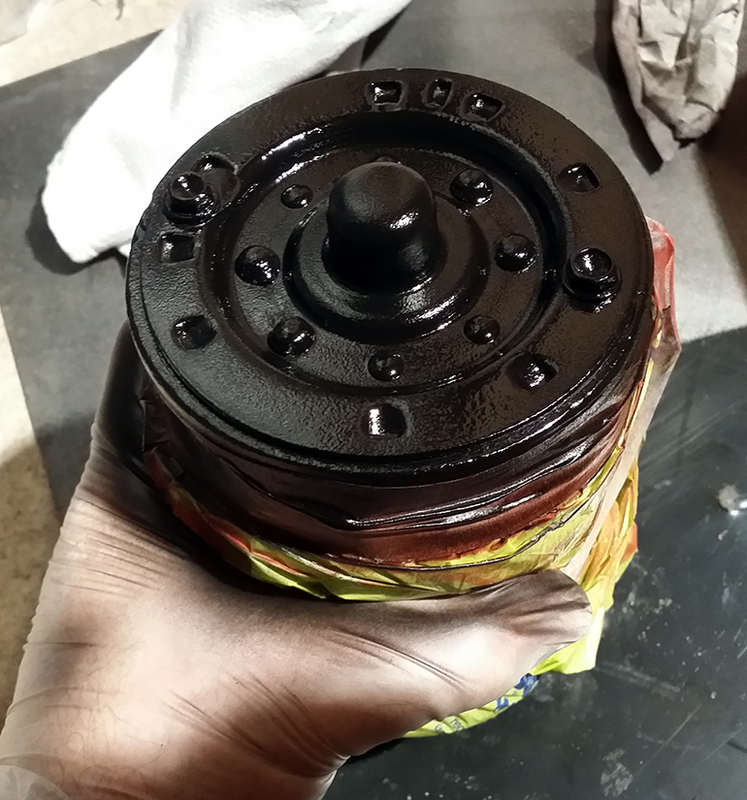 The case of the starter was finished with a further couple of coats of satin black and allowed to cure. The back of the starter was covered to stop over spray so this would need to have the same process. Once the case was cured I reversed out the masking to spray the back plate. The silver parts of the starter being the band and the solenoid cover were given the Red Oxide and a cover of silver and allowed to dry. With the parts all dried and cured it was reassembled with the gasket and solenoid cover plate. The winding cover band was carefully pulled over the end in order to stop scratching the paint off, align carefully to make sure the cover for the solenoid is under the band and all the openings for the winders are completly covered to stop water ingress. Insert the bolt and nut tighten up. The starter Now looks like new and the internal workings are looking good. I didn’t mess with the wires in anyway so they were not disturbed to cause problems. When fitted the starter will look great next to the fresh painted engine.